The University has announced that it will bring forward its ‘Tyndall Place Programme’. The first stage is to pedestrianise Tyndall Avenue. The intention is to establish a strong identity at the University’s heart by developing a pedestrian-focused high quality public space. 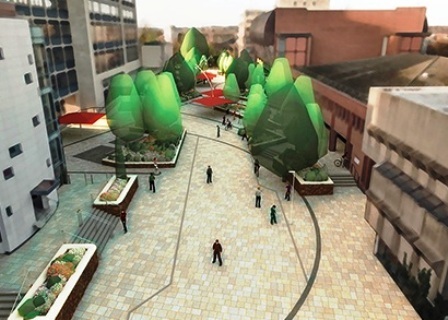 Subsequent projects will refurbish the Sports Centre, the Computer Centre and Senate House, to make it the student services centre, and to build a new University library on the Hawthorns Hotel site. If the Council grants outline planning permission the University will apply for a Stopping Up Order to prohibit motor vehicle use. Pedestrianisation will allow the removal of most traditional kerbs and barriers to movement and the redesign and repaving of the whole area. The 9, 16 and 72 buses would be diverted to St. Michael’s Park from Tyndall Avenue. To permit widening St. Michael’s Park the University will transfer land taken from service areas behind University buildings. The Society supports the principle of the scheme and agrees there is the potential to create an interesting public space. These are some of the issues that the Society raised that affect Bristol residents. The Society supports pedestrianisation, with cycle access. It would generate local goodwill if the University absorbs the loss of the Tyndall Avenue parking bays from the permits that it allocates to staff. There is a strong local perception that Tyndall Avenue would become an ‘exclusion zone’. Many residents feel unwelcome in areas surrounded by University buildings where students dominate. The assertive signage of University buildings contributes to this reticence. Far from seeking to exclude the public the University says that it welcomes public access around it campus. The University could overcome the public perception with considered naming, signage, legible public realm and the behaviour of security wardens. It is important for the public to feel welcome to use the area. The Society supports the proposal to blur the boundary with Royal Fort Gardens but we are anxious that the design should be kept simple, clear and almost formal. This is a wide space flanked by large institutional buildings and free of traffic. A bold and simple layout using trees would create a classy new public space, flexible in use and economical to construct. The ‘indicative’ design for Tyndall Avenue does not suggest this sort of clarity but an attempt to create a quirky, curvy, broken up space. A lesson to be learnt from the recent public realm improvements in Royal Fort Gardens behind the Life Sciences building is not to ‘overdesign’ a new public open space. December 2017 update: The Society has responded to the University’s application for planning permission to close Tyndall Avenue to through traffic, to widen St Michael’s Park to accommodate diverted traffic, and other enhancement works. The Society supports the principles behind the scheme. There is the potential to create an interesting space that the public could share with the University. The Society welcomes the pedestrianising of Tyndall Avenue and the proposal to blur the Royal Fort Gardens boundary. This scheme together with the forthcoming changes around the Hawthorns site, will provide an identifiable centre for the university. Although the Society supports the changes in principle it regrets that it cannot support the current scheme. The proposal is over designed, which gives the impression of a private space closed to the non-University public. The graphic paving pattern, the curved build outs and planting will create a barrier that will confuse the public and create a belief that Tyndall Avenue is private space. March 2008 update: a planning application has been submitted. Whilst the Council supports the scheme in principle, its Highways department has rejected St Michael’s Park as suitable for buses, so further discussion is needed between the University and the Council. Bristol University’s plans to appropriate a public highway as part of their ‘campus’ include the alleged benefit of increased pedestrian space; there is already an abundance of pedestrian landscaped space in the form of the Royal Fort Gardens which the university has recently spent huge sums on remodelling, albeit with no great improvement in public access. Their proposal is based on several other incorrect assumptions, among them that the proposal will add coherence to their collection of mediocre buildings that front the street and that the diversion of all the traffic into the much smaller St Michael’s Park will not have seriously adverse effects on that street. The proposals are rather clumsily designed and such coherence as they have is based on overpowering and arbitrary geometry shown to dubious effect on the edge of Royal Fort Gardens. The university likes to think of itself as a good neighbour. If the university really wants to improve the area it could do so by a carefully considered alterations to the surfaces, width, planting and building frontages in Tyndall Avenue, retaining an important thoroughfare, keeping it safe at night and avoiding wasting money on destructive road engineering and gratuitous pattern making elsewhere. As a local resident I am afraid that I am not supportive of this appropriation of Tyndall Avenue as a public highway by the University to create its own pedestrianised space that will not appear to be part of the public realm but rather just part of their “campus”. Just as Southwell Street has become little more than part of the hospital trust, the same will apply to Tyndall Avenue as it becomes Tyndall Place. The university’s suggestion of widening St Michaels Park for this to become the busy bus route and only obvious connecting vehicular access between Queens Road and St Michaels Hill is not sensible. The university’s own nursery is situated on St Michaels Park with parents having to park and drop off very young children, whilst the road is also well used by children walking to and from Bristol Grammar School and other schools in both directions as the quickest pedestrian route from Cotham Road South to Queens Road. The left turn onto St Michaels Hill would also be particularly tight for a bus to navigate, while a much safer pedestrian crossing from Myrtle Road to St Michaels Park across St Michaels Hill would go from being desirable to absolutely essential. A better option for Tyndall Avenue would be the creation of a “shared space” with the removal of kerbs, but which would still allow for buses (and possibly even taxis) to pass through at slow speed. Such a concept has been successful around the museum area of Exhibition Road in South Kensington. Additionally Tyndall Avenue could even become one way from St Michaels Hill should it be desirable, with buses from Queens Road instead routed along University Walk, Tankards Close and Royal Fort Road to reach St Michaels Hill, should the frequency of vehicles in both directions be considered too great. It would seem that in the current proposal all of the benefits accrue to the University, whilst everyone else is relatively inconvenienced. Given how resistant it was to the re-routing of buses coming up Elton Road, despite the obvious dangers to pedestrians, particularly children, by the traffic chaos caused by their insistence on having buses stop directly outside the Hawthorns, I would suggest that my concerns regarding the consequences of this proposal and how these have been downplayed by the university are very real. Peter’s comments represents a constituency that forcefully expressed itself at the University’s public presentation of the scheme. The meeting extensively discussed Peter’s alternative shared space proposal, which the University Masterplan proposed in 2006 and the specific example of Exhibition Road. Others opposed any change. The University of Bristol is renowned world wide for its academic excellence-nearly on a par with Oxbridge. Its expansionist ambitions are therefore understandable. However as an ‘adopted daughter’ of Bristol (I came here in 1963) I am increasingly concerned that it is taking over all the most elegant, historic and popular spaces and buildings in Bristol’s centre and in particular in Clifton-previously inhabited by ordinary citizens. It gives nothing back in return. I remember the once popular public spaces, filled with good quality shops and facilities around Queen’s Road and Park Street. We all used to visit that area to meet friends as well as enjoy decent retail services. Now it is all filled with student tat! (Before anyone thinks this is sour grapes on my part, I should say that I am a graduate of London University, so I do understand that students need their own ‘spaces’.) I performed in operas many times in the Vic rooms and enjoyed conferences there (one of which I organized for the SDP in 1990!). That too is now monopolized by the University, leaving Bristol without a prestigious performance and meeting space. Indeed it used to be an iconic building visited by famous people. Whiteladies Road, again once a popular public retail area, has been reduced to student bars and eateries. In the past I with many others have enjoyed classes in the Further Education unit of the University too. No longer are even those small services available to the citizens of Bristol who are being excluded bit by bit from the city for which they all pay very high rates. I believe that the alienation that now exists between our youth and the older generations -fomented constantly by journalists in the national media-is and will be furthered, by the exclusion of ordinary working citizens from ‘elite’ University areas in Bristol. I am therefore totally opposed to any more parts of the city being made exclusive areas for University students, who are not here all the year round either. This is a public highway and if monopolized by the University as all the other main streets are now in this part of Bristol , it will become even more of an exclusion zone than it is already. We wish to support the reservations expressed by the Civic Society over the proposal for alterations to the existing character of Tyndall Avenue. It is clear that the University of Bristol is in the forefront of academic institutions of Great Britain however in our opinion their proposal for Tyndall Avenue will not achieve the genus loci that will satisfy the desirable character for the heart of the University of Bristol. The policies contained in the University Master Plan of 2006 should be the guide line for the current general proposals which are suggesting improvements that are not integrated with the important threshold from Woodland Road which will be marked by the imposing scale of the Senate House and the proposed new library building on the site of the present Hawthorns Hotel. We consider that the design of this interchange must be very carefully made to insure that the experience for the public will be one of admiration thus we are sure that the current proposal is premature and if the City Council is pressed to respond it will be appropriate to refer to the existing approved Master Plan which will guide further consideration by the University.